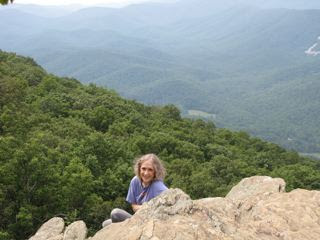 The focus on having 60 new experiences rather than on being 60 has been a lot of fun. (The Story Began Here) It makes me take notice of each day and what it contains. I've begun to look deeper at things I may normally pass by ... and I think more on what I'd like to do. Too much of life is all about work, whether to earn a living or things that need to be done at home. It's definitely put more joy in my soul and more adventure in my spirit. I love it and highly recommend it! #6 of 60 - Now and then we drop into Whole Foods since we enjoy some of their sandwich breads. I love to look at the produce although the prices provide no enjoyment at all, but we've found things at great sale prices when they need to unload excess stock. That was the case on the day I saw Organic Champagne Grapes. I'd never heard of them! Champagne grapes are not grapes used to make champagne. The variety of the grape is actually Corinth. They are rarely used to make any wine at all. 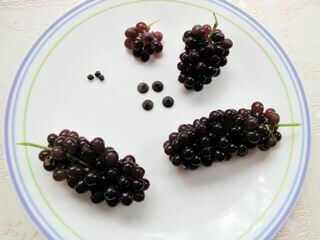 The novelty is their small size and lack of seeds; it's actually the smallest of seedless grapes. Most are black as shown but red and white varieties do less commonly exist. Maybe you've heard of Zante Currants, which is what these are called when they are dried, but not to be confused with the true currant. They actually got their name when a magazine was doing a photo of them and placed them alongside a glass of champagne. They were definitely delicious. They were too small to pull off one-by-one with your fingers, so we took a mouthful at a time since they easily came off the stem. Incredibly sweet and bursting with flavor! #7 of 60 - The Joe Pye Weed that grows below the deck against the rain spout (they love water) has attracted many butterflies over the years and all kinds of bees and wasps. I love being able to see things at eye level from the deck rail it rests on. 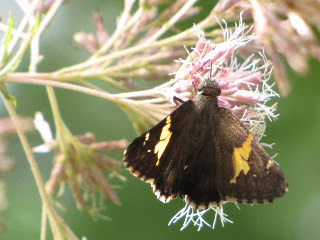 On August 26th, it provided me with a new butterfly that I have never seen, the Hoary Edge Skipper Butterfly (Achalarus lyciades). This gorgeous spread-winged Skipper is similar to the Silver-spotted Skipper that we see here, but much less common, so that make it a special treat to have one. It is said that it's the sign of a good day when you see one of these. Since it was 11:30 when I photographed it, I was already having a great day. 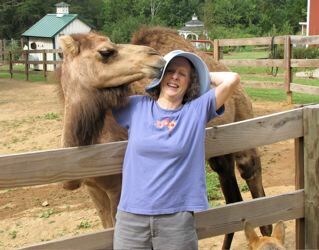 #8 of 60 - On my actual birthday I was blessed with quite a few 'first experiences' beginning with our visit (me, my hubby Randal and our son, Benjamin) to Mountainside Petting Farm where I was romanced by a camel. This snuggling snuzzling sweetheart, known as Chloe, was such a delight to my animal-loving heart. I've seen a camel before at a local nativity event at Christmas, but I've never had an experience with a camel. Chloe has been with her owner since she was two weeks old, so she's not your typical camel. She doesn't spit and doesn't smell, but she loves nothing better than to steal kisses non-stop. She seems to have been even more determined since my hat would get in her way. She is all eyes on what goes on at the farm, but she was our beginning and ending to our visit there ... and definitely the highlight of the entire day of my birthday. #9 of 60 - Not all experiences need to be good experiences and since I'm not a fan of eating out, this one isn't a surprise. About a month prior to my birthday I noticed an ad for Ambrosia Bakery and Deli, which was not far from the petting farm, offering a free dessert with a $10 purchase. We needed to pick up lunch to take to the Blue Ridge Parkway ... and the dessert sure was enticing ... so it went on the itinerary for the big day. I'm not much on eating out, but the name Ambrosia linked up with my love of coconut and it was a good match ... until I got there. 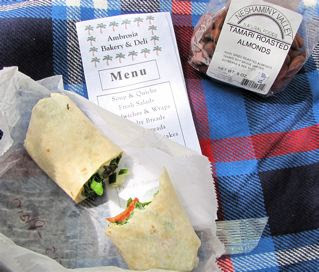 The sandwiches were all wraps if you wanted vegetarian ... and they only had cheese wraps (nah!) or white wraps (yuk!). Oh well, I'm not in it for the food ... I took the white one. Now to choose a dessert ... hmm, mostly chocolate (I don't do chocolate). The guy recommended something with Bavarian creme. I asked if it had cream cheese in it (disgusting :-) and he said not. So the croissant part of it looked fine and I remembered the flavor of Bavarian creme from when I loved Boston Creme Pie. Well, we got to our picnic point at Ravens Roost and it was definitely not about the food. I got half the sandwich down and wrapped the other half for my hubby who was enjoying the same. Thinking dessert would be the highlight of illegal food (what I call anything that's off our normally naturally healthy diet), I bit in. Yuk! Cream cheese. Oh well ... it was then that I thought to myself ... another new experience to have your birthday lunch be totally bad. Didn't know it at the time, but dinner was the same. What a delight to get back home to my own refrigerator. The day was not about food! #10 of 60 - After such a boring lunch (excluding my family that I ate with), I wandered about the rocky area for views from the ridge and saw a place to scoot down the rocks on my bottom, to add a cliffhanger experience and some adventure to the day. I grew up with my grandmother who had a lot of fears. After God delivered me from a deep fear of bugs (from my grandmother) and the terror of the dark (acquired from a childhood experience) shortly after I gave my life to Christ, I decided to continue the pattern and not let fear rule my choices in life.